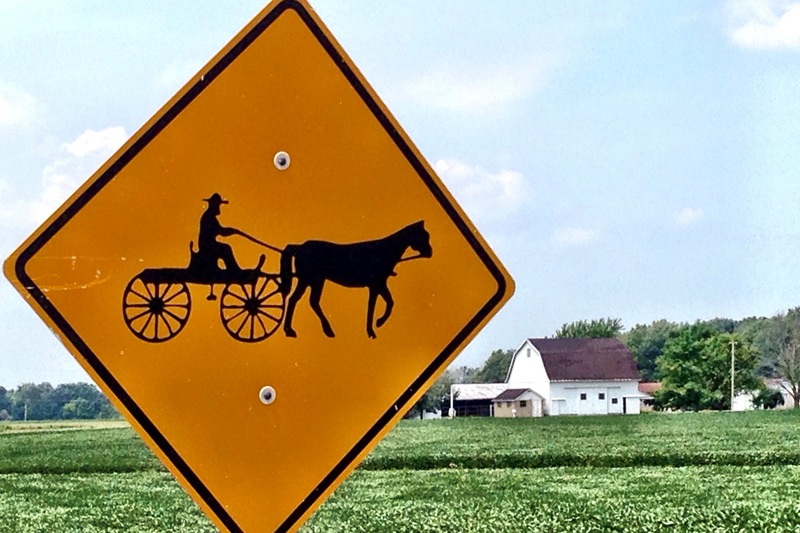 Little Switzerland and Roller-Blading Amish – Indiana Rocks! 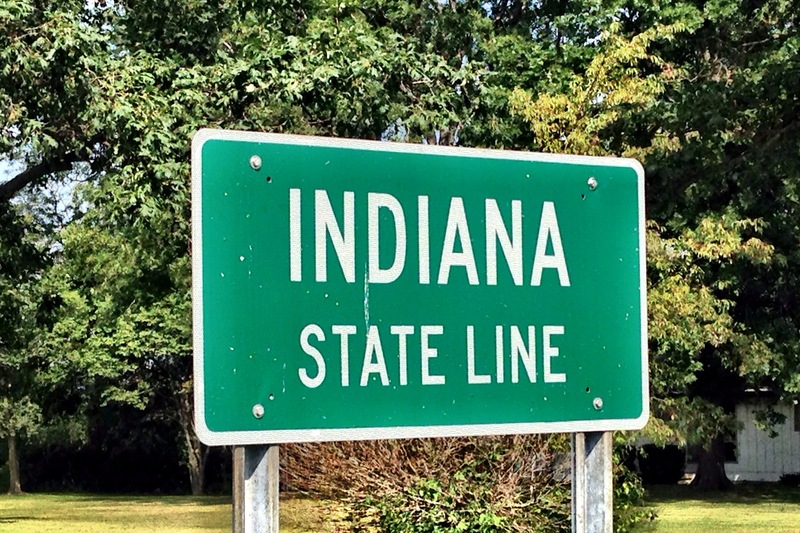 Having tanked up on a bucket of coffee at the edge of Ohio, I headed for my first state line. State lines have a sort of mythical status, derived from old films; make it to the state line, and the police can’t catch you. Make it to the state line and everything changes. Having seen masses of fields with nothing but soya beans and sweet corn in Ohio, it was a little disappointing that I crossed the line to find, on one side of the road, a field of soya. And on the other side a field of sweet corn. But I pressed on, and things did, indeed, change. I stopped at a petrol station for a drink. There was a young guy sat outside, who I think was Amish (might have been Mennonite, or something similar – I’m not an expert, and somehow we never got round to it in conversation). Anyway, Phil had a home-made haircut, a clean-shaven face with a beard sprouting enthusiastically from under the jawline, and was dressed in a sober white shirt and sensible black trousers. We had a chat, with him seeming especially interested in ‘campsite hotties’, which I couldn’t really help with much. And then he got up to leave. On his roller-blades. It may (well) be my ignorance, but I’m not sure that roller-blading is a standard Sunday morning activity in either the Amish or Mennonite traditions. Phil may well be a dangerous radical within his community, so I’ve changed his name to save him potential grief. But he was a sure sign that things were different in Indiana. I was happy. Another sign was the amount of horse droppings I was having to navigate around on the edge of the road. There were more blacksmiths around than I’d seen for a while too. And the road signs were different. I only saw one actual buggy, which I flashed past at a junction. I guess it was pretty quiet because it was Sunday. But I’m definitely not in Ohio any more. Pressing on to Berne (the clue’s in the name), I was suddenly transported to Switzerland. 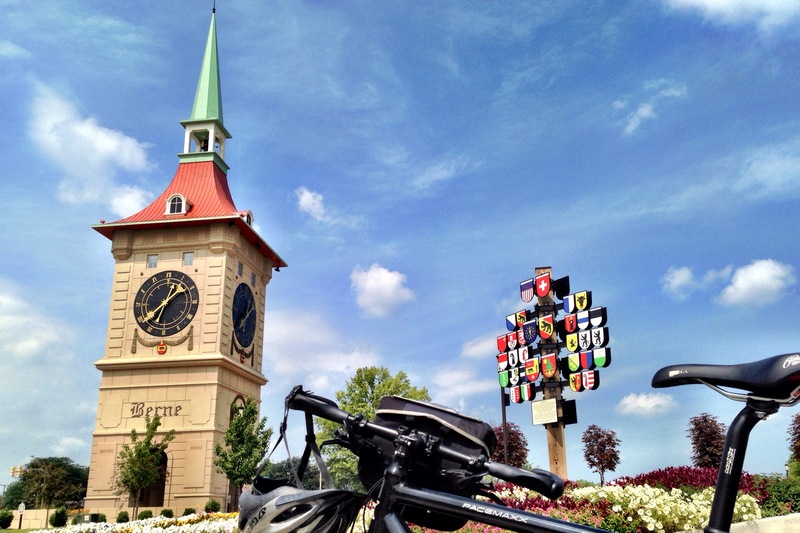 Chalets popped up by the roadside, and I sat for a while next to Berne’s magnificent Swiss clock tower. Slightly disappointing that it’s not a cuckoo clock tower (at least literally) but still impressive. I decided against heading further south to Geneva, as the alps would be in the way, and turned west towards Marion. I got distracted by ice cream (again) at The Point, a nice little restaurant on the highway. Phenomenal strawberry cheesecake ice cream, incidentally. I headed on, looking for a campsite. Four miles further on, a man had parked his car, and was waving what turned out to be free T-shirts at me. This was the owner of The Point, who’d heard I was English from his staff, and chased me up the road to give me free stuff. Amazing. I mentioned looking for a campsite, and he stood aside, revealing a sign (I should point out that he wasn’t so big as to entirely block the sign, I was just distracted by the T-shirts). 200 yards up the road, Wildwood Outdoor Escape beckoned. Serendipity is not to be denied. I’d done a hundred km, so decided to call it a day. I came in, paid for my spot, and had a chat with the owners about the ride. And a few minutes later they came to my site and gave me my money back (and a little extra) to ‘help me on the road’. Astonishing. It’s fair to say that was quite a day. I’ve been a little bit blown away by Indiana so far, and have to offer my heartfelt thanks to all those who made my first day here so memorable.